Jamon Serrano is one of the most popular foods in the Spanish culture. It is the hind leg of the white pig, obtained under high class slaughtering and butchery conditions and subjected to a process of salting/drying and curing under strictly controlled conditions . 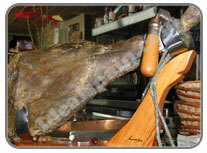 There are very strict government guidelines for the production of Serrano Jamon. The result is a stable meat product with exceptional taste and nutritional qualities. The word "serrano " in Spanish refers to the sierra, or mountains. Jamón Serrano is traditionally produced in mountainous environments where the air is clean, the moisture levels just right and the winters very cold. These are the basic traditional requirements for curing. Need to transfer money into Spain? they have rolled fresh hams in sea salt and hung them from their rafters to cure. A year to eighteen months later the jamones are ready to mount on special stands that are designed so that anyone can stop by, carve a few paper-thin slices, and enjoy. A special, very sharp knife is sued for the job. Jamón serrano is more than a delicacy in Spain; it is a normal part of every family’s life. Every tapas bar and neighborhood café have their own hams. Most families will have one on the go at home. Once you have tasted a good Jamón Serrano, you will understand what all the fuss is about. It tastes like nothing else on earth. The quality does vary though so don't be put off if the first one you try isn't to your liking. The secret to jamon lies in its curing, using traditional techniques. This tradition is kept alive in rural areas where in early winter, family and friends gather to slaughter their livestock in preparation for the winter months. The hams are placed in sea salt for a brief period of time (approximately one day per kilo). They are then strung up. The right time to eat them is when an experienced ham-master inserts a long splinter of cow bone and whiffs the jamón, like a connoisseur of wine who sniffs the cork.